A cockle picker caught in the Morecambe Bay disaster shouted "sinking water" as he tried to get his message across to a 999 services operator. The jury at Preston Crown Court was read a transcript of the conversation, in which the distressed caller was heard over moans and cries of distress. 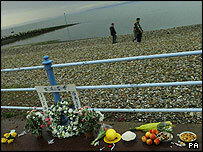 At least 21 Chinese cockle pickers drowned in the rising tides at Hest Bank in Lancashire on 5 February 2004. Lin Liang Ren, 29, from Liverpool, denies 21 counts of manslaughter. He also denies perverting the course of justice and facilitation - helping people breach immigration law - along with his girlfriend, Zaho Xiao Qing, 21, from Liverpool. His cousin, Lin Mu Yong, from Liverpool, denies facilitation, along with father and son David Anthony Eden Senior, 62, from Irby, Merseyside, and 34-year-old David Anthony Eden Junior, from Prenton, Merseyside. 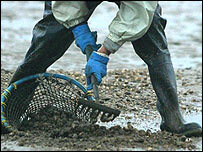 The workers, who were all illegal immigrants aged between 18 and 45, became trapped in high tides on Warton Sands. The court was told how splashing water and gusts of wind could be heard in the background of the call, which was made at about 2130 GMT. The call centre operator tried to communicate with the caller, who did not seem to understand English, but after two conversations the phone went dead. A Cable and Wireless operator took the first call but could not understand the caller so passed it on to police. A police call centre operator, called Miss Watkins, rang the man back and could hear the words "sinking water" being shouted down the phone. The transcript of the call said: "There is the sound of wind and water and other foreign voices shouting and crying out in the background." The caller tried to pass the phone to someone English but the voice continued to shout "sinking water" until the phone went dead. The court also heard from coastguard operations manager Sue Todd, who was called in to help on the night of the disaster. She told the jury that large numbers of people had continued to go cockling after the tragedy. The court then heard of several other incidents when the emergency services had been called to rescue cocklers at Morecambe Bay since 5 February. When asked if there was anything she could have done to stop the cockling from continuing, she said there was not. "All we could do was try our best to educate and inform those working there," she said.